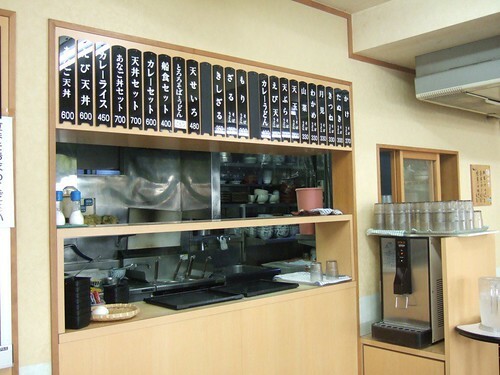 Photo: The fresh noodle counter at Funashokuseimen. Funashokuseimen means “ship food manufacturer of noodles” but the name is a pun on the neighborhood name, Funakoshi. So, maybe it should be: The Nautical Noodle Maker of Funakoshi. A Japanese naval base is within walking distance, so the ship pun in the name is very apt, but mostly I have seen Toshiba factory workers in blue overalls eating here. They come for a quick meal (the shop is open from 6 a.m. to 8 p.m.), bolt it down, and head to (or back to) work. 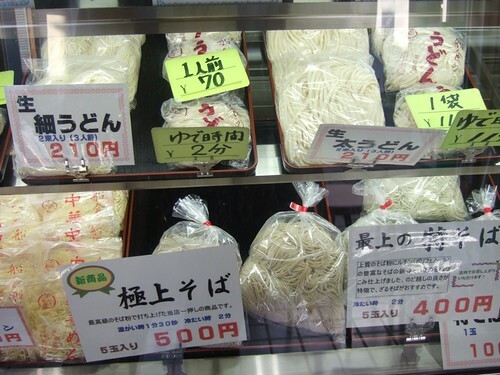 At the fresh noodle counter there are “fat” and “slender” udon (made from a very fine, white wheat flour) and different quality grades of soba (made from buckwheat flour). 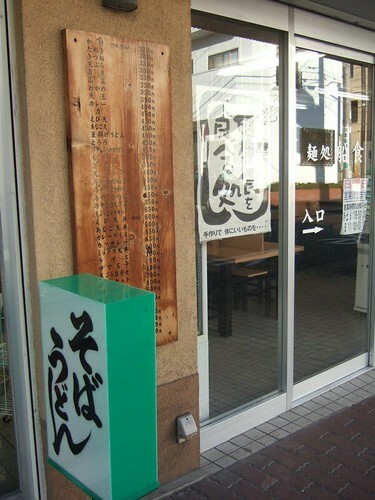 The signs at the bottom of the photo say “ultra-high quality soba” and “most high quality soba” with prices to match. They also sell little packets of the broth or dipping sauce to go with the noodles. I’ve made a few dishes at home with Funashokuseimen noodles. I was there in early December and they were advertising the soba made with newly harvested buckwheat (shin-soba). The eat-in area (above) features ladies in kerchiefs behind the food preparation window (who all ran away after I asked to take a photo). It’s a no frills, no table service, bus your own tray, get your own water place. They serve run-of-the-mill soba/udon dishes like tempura soba/udon, zaru soba (cold noodles with a dipping sauce, served on a flat slatted bamboo tray), tanuki soba/udon (noodles in broth with a garnish of the little fried bits left over from making tempura), kare (curry) udon, and so on. Nothing gourmet, but a very cheap, decent, quick meal. This place is better than the average noodle joint that one would go to in a frantically busy commuter train station. After all, Taura/Funakoshi is a sleepy little place away from the frenzy of Tokyo and Yokohama. 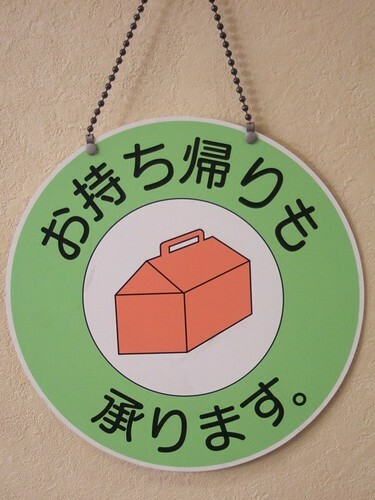 The sign below says, “take out is also OK,” but it is written more like “take out orders also will be humbly agreed to.” The lunch box says it all.